This shows examples of the Gemstone Section of Lumari's Guide to Crystals and Gems. This example shows the gemstone AMETHYST. 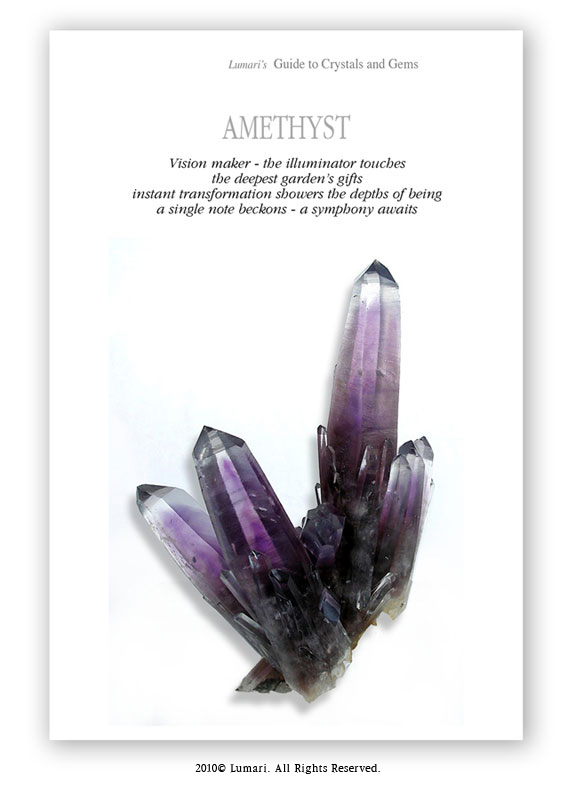 The first page features a full page, full color photograph of the gemstone Amethyst. This page also includes a special Gemstone Poem Meditation written for that gem. as well as information about the chakras, planets, zodiac and more. As you can see, one of the attributes for Amethyst is that it attracts and increases wealth. you can just look up Amethyst in the eBook and discover all of the powerful attributes and qualities that this crystal imparts. There are over 200 Crystals and Gemstones featured in this section alone!